I wish I had picked either a darker yellow or a pale green for the leaves as they do not stand out well hopefully they will be better once they are not on a white background. I am using basic faggoting for the petals and leaves. But please feel free to use fancier stitches I am trying to get caught up with all of the months. So some I will do very simply just so you all have an idea of what they look like finished. I still have yet to decide if the center opening is big enough to fit a child's head through and make a yoke of a dress or if I am making a doily. Only time will tell on that adventure. I think I am progressing on this pretty well. I have 2 flowers faggoting done on petals and leaves only two more to got hen on two the back ground. 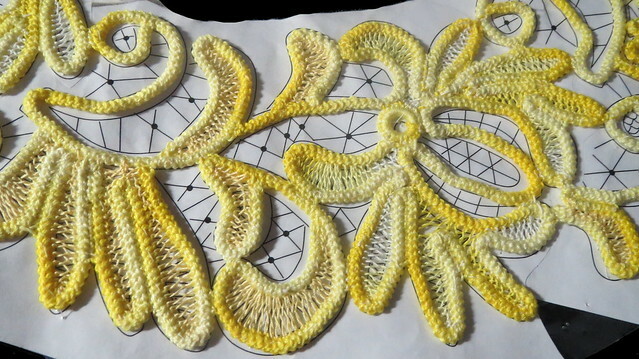 The cord is a yellow on yellow variegated but the thread I am using for the petals is a yellow on yellow with white variegated. 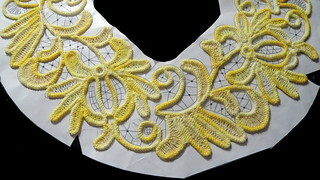 So it is kind of hard to see some of the filling stitches on the white back ground. 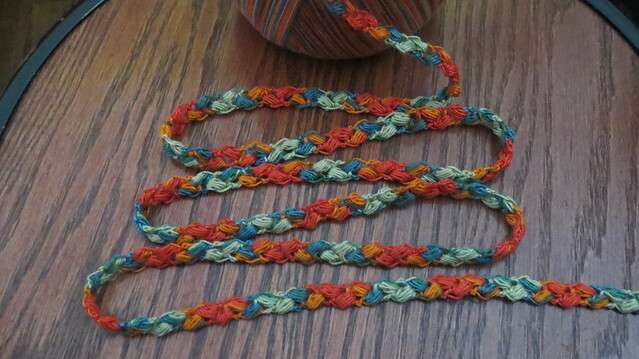 i have also made some more wheat stitch cord today. This is a thread I have for a while that I keep trying to use and keep frogging. I think I finally found a project it looks well in as a cord now I just need to find a pattern that this cord will look good in.